If you're tired of the white-and-beige bathroom, you're in luck as this year's	décor gets a stylish update with gold detailing, geometric patterns and strong dramatic colours. Think grey, mustard, ginger and even orange! Look out for champagne golds, sun-kissed caramels and gleaming coppers. These lustrous hues translate across all elements and can result in a smoky, sultry effect. Natural materials like wood, plants, natural objects and fibres will play a significant role too, helping to create a restful space, bringing the outdoors inside. We will see softer organic shapes too that will be accessorised with hand-crafted pottery or handwoven textiles. Whether it's on the floor, a piece of furniture or a console for the wash basin, wood creates a lovely homely atmosphere. It provides seamless transition from the bathroom to other living areas, and is completely in line with the current trend. All the current key trends have an element of gold in them. It's the 'golden hour' of Dark and Light; it's the gold that appears in the paintings of old masters and also in modern design trends. Ochre Gold is both bright enough to attract attention and combines well with other tones to create a tonal effect, a relaxed neutral combination or something more surprising. Need some more inspiration? Our Pinterest boards are overflowing with ideas. Go on - take a peek! Metals are coming back in full strength. 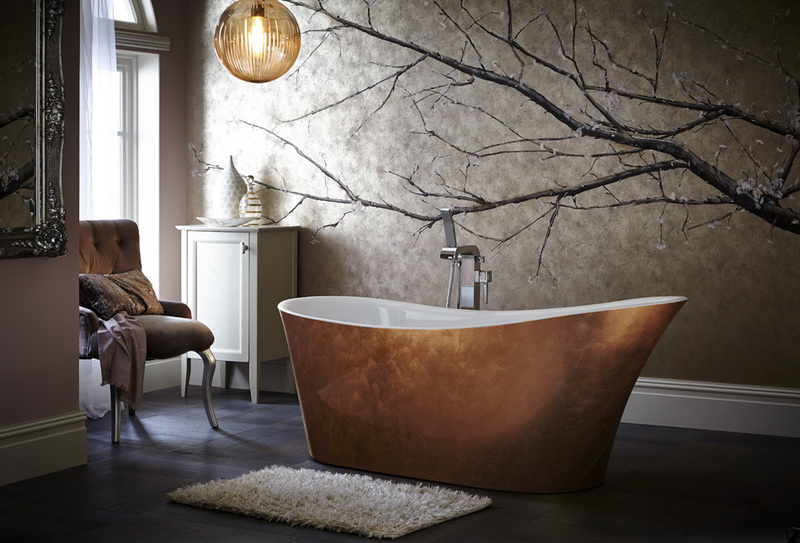 We saw a little bit of rose-tones and copper last year, but you can embrace it fully over the coming months as these warm gold-tones especially in taps, heated towel rails and products like copper baths ooze opulence and longevity. As the ultimate signature of style, it's still hard to beat a beautiful freestanding bath and now's the time to be brave with colour and shape. 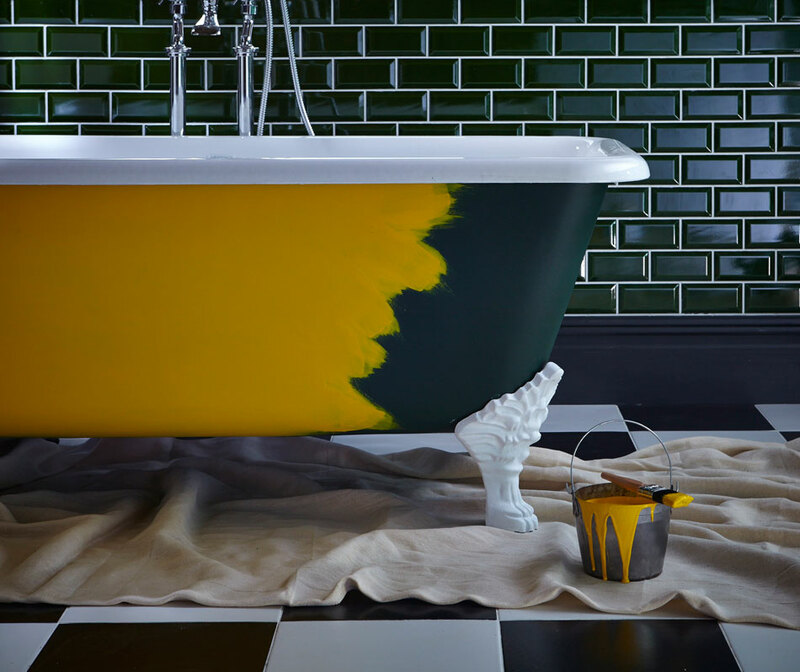 A boldly painted exterior on the bath or an eye-catching shape, such as a bateau style or slipper design, is especially striking. 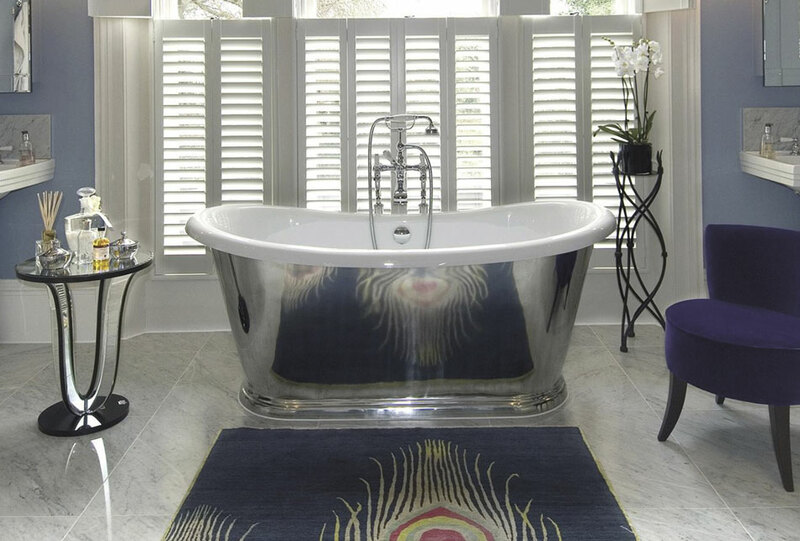 BC Designs Boat aluminium bath on display at our Nottingham showroom. Whether it is a backsplash, an intricately patterned floor or walls, tiles are bold with a capital B! 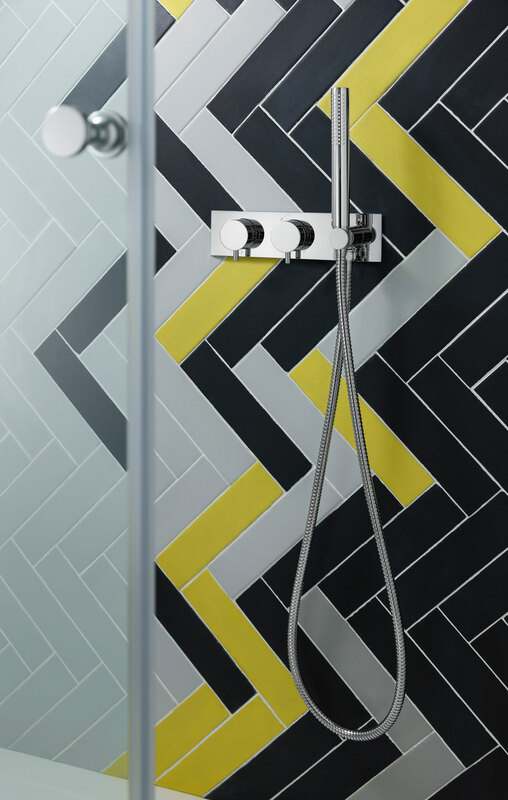 We wait to see if consumers will gravitate towards the more color-block and bold geometric patterns characterised in the 1930's, 50's and 70's which we are now seeing in tiles. Flowing straight from 2015 is the double shower or walk-in spaces which are certainly still on the 'what's hot' list for bathroom trends this year. The difference in 2016 is that the space will be more refined and intimate. It's not how big it is, but how cleverly you use it. Think shower controls outside the shower area, Bluetooth speakers used via your tablet or phone and built in alcoves for toiletries. From our walls to under our feet, animals are everywhere in 2016 interiors as is the tribal influence and it goes beyond just textiles. It includes natural horns as well as artwork and accessories, carved wooden ornaments and even animal print towels and fake zebra skin rugs. The growing trend of artisan non-mass produced items is now reaching gigantic proportions, with lots of handmade marketplaces online. They're a great source for finding crafty bathroom items such as lotions packaged in chemist's style jars which look beautifully old-school as well as handmade bath mats and vases.